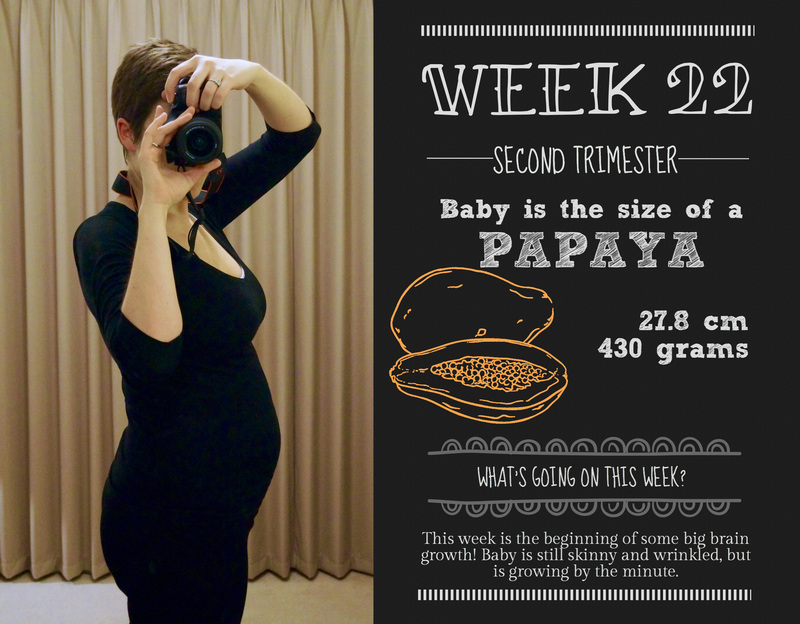 What I’m cooking: A skinny, but growing baby! This week is all about brain development, and while Grub still has wrinkly skin and hair all over her body, she’s getting bigger every day! She weighs nearly half a kilo now. Main symptom: still this damn hip. I was back at yoga this week though, and got some great stretches to help with it. I’m trying to do them every night, and hopefully they’ll make a difference soon. What’s on this week: As you might be able to tell by the lateness of this post, work! There’s not been a lot on in the baby world, apart from some enhanced kicking, but work has just taken over. I’m looking for some stress reducing activities to help me get through the next little while. The weight is still piling on steadily, I’m up over a 6 kilo weight gain now, and one of my pregnancy apps is happily showing this as being at the very top range of where I should be (I deleted one app for telling me I was over my scheduled weight gain at a massive 8 weeks pregnant, so this one needs to watch itself!). It’s a little disheartening seeing that graph and thinking that maybe I’m doing something wrong, but at the same time I feel good, I don’t feel like I’m packing on weight where I shouldn’t be. That said, my undies aren’t fitting quite as they used to, and I think there’s definitely more, ahem, junk in my trunk. Hoping my arse returns to original size post-pregnancy. I’m still rocking an innie bellybutton, although I have a very deep bellybutton – I feel like it’s a lot shallower than it was, so we’ll see if I get to the outie look at all. I’m also heading towards the ‘viability’ stage, where the chances of Grub surviving outside of the womb increases exponentially. Some areas I’ve read put this at 25 weeks, others at 27 (the start of the third trimester). Either way, it’s fast approaching, and while there’s still a long way to go before we’re out of the danger zone (while these babies can survive, many have disabilities or ongoing health issues), it’s great to know we’re not far away from a healthy baby being born. Grub and I are hanging tight this week, and next week looks pretty similar, but at week 24 Mr Nester and I are off to a birth class, which is very exciting. It’s run by the woman who runs my prenatal yoga class, and is basically a shortened version of the CalmBirth workshops (which are much more expensive, and I assume more intensive). This class is a few hours long, and focuses on breathing techniques, birthing positions, and basically ways to deal with the process, without the fear factor. It sounds great.